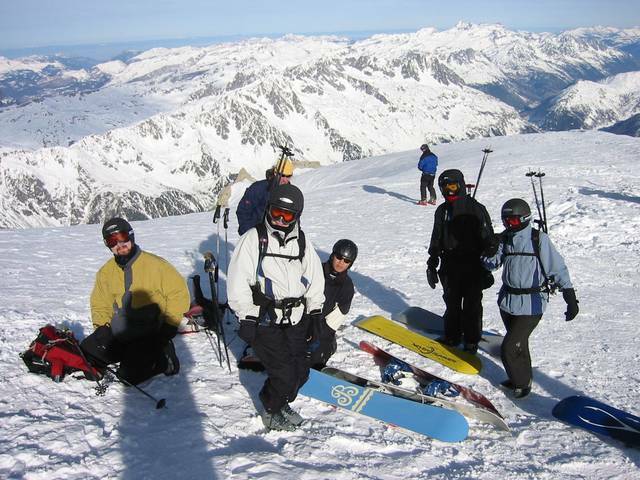 In late January 2002 myself, Oren Jacob, Justine Meyers, Ken Lao, Jason Bickerstaff, and Kim White headed to Chamonix. This trip was not only midwinter instead of spring, but we hired a mountain guide for the week, meaning we spent almost the entire time in the glaciers around Chamonix, finding amazing snow and great riding. We had a week of great days at Chamonix. Here are direct links to some of the locations and activities from that week (or, just keep following the 'next' links at the bottom of each page). The group after descending the "walk of death" from the top of the Aguille du Midi. From left, Jason, Kim (in front), our guide Bernie (behind), Ken, Oren, and Justine. I'm not in the picture except as the shadow falling on Jason! 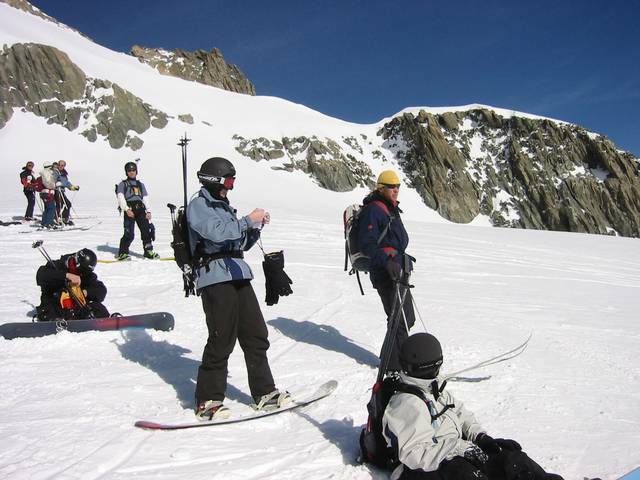 Here we are descending the Argentiere Glacier on the south side of Les Grand Montets, Kim is at bottom right, Bernie our guide above her, Justine in blue, Oren fiddling with gear as always and Ken standing in back. The skiers, needless to say, weren't with us. Photos in the Chamonix 2002 section of the site were primarily taken by Leo, Ken, and Jason. Alt text for each photo credits the photographer. All photos copyright by the photographer. Click on most photos for 640 res version. Higher-res versions of all photos are available by contacting the photographer; I'll be happy to refer you. See the main page for email. Most of our week was spent riding on active glaciers in the high alpine. In general, everywhere we want (except the Col du Plan) was easily accessible intermediate riding. However, we had a licensed "guide d'montagne" with us at all times and had numerous experienced party members. 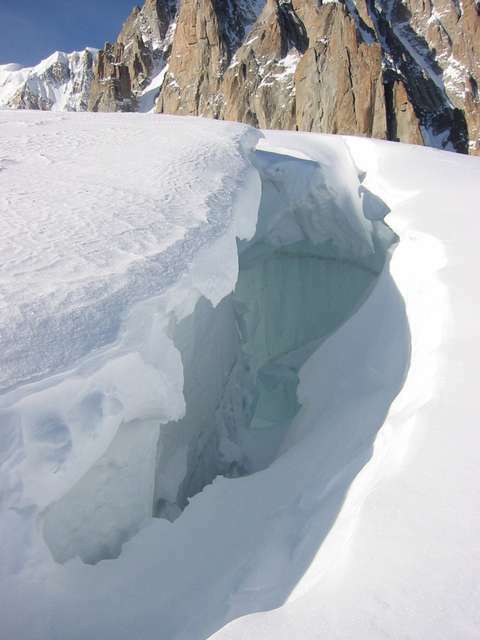 Glaciers are unpredictable and crevasses like the lovely item at right do open up quickly, especially in the spring. Be aware and unless you are experienced in the Chamonix area, use a local guide. In addition to knowledge, they'll usually be able to easily arrange for any necessary climbing harnesses, ice axes, or collapsable poles your group doesn't already have. This portion of the website is dedicated to the memory of our guide, Bernie. Bernie loved the mountains and living his life in them. 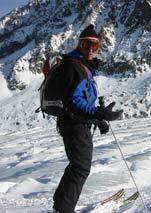 In the 2002/3 season, about one year after we were in Chamonix, Bernie died guiding a group down the Col du Plan to Italy. He was the first person I've personally known who died skiing. Bernie always said that, as a guide, if anyone else in your party was injured, you weren't doing your job. Bernie was the only member of his party to be injured. He fell in a crevasse that had opened under the snow and it is believed he actually died in the fall. It took several days to recover his body. 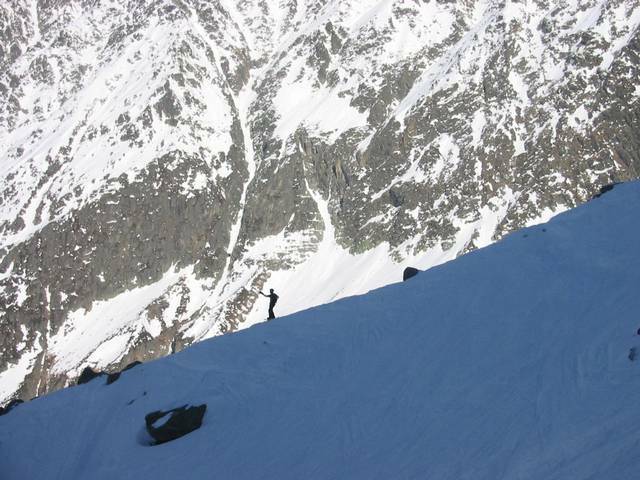 Bernie wouldn't want anyone to stay away from the mountains, but his tragic death reminds us all to be careful in the backcountry, and reinforces the importance of having a professional guide in Chamonix.